CEO for MESC Galumalemana N. Petaia signed the agreement together with FFS CEO Mr. Frederick Young. ‘Just Play’ is designed for children between the aged 6-12 and is based around structured activity. Equipment packs containing balls, cones, bibs, activity manuals and other resources are distributed to schools, which enable children to play football at anytime and in any situation. 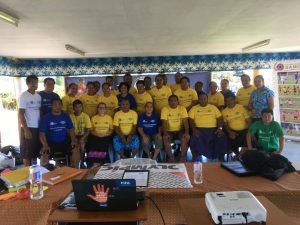 ‘Just Play’ has been designed and funded by the Oceania Football Confederation and the Government of Australia. 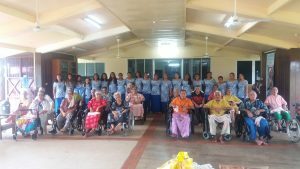 This program has also already been lunched in Tonga and Vanuatu. School Teachers and volunteers will be receiving training by OFC in cooperation with FFS to provide and teach students on how to develop game skills and lead healthier lives. MESC CEO Galumalemana explained that the ‘Just Play’ program “is a learning opportunity for young children which provides them with quality education through fun sporting activities. Children will be able to learn in a less formal and confining classroom setting by learning outside on the field where there are more open spaces. It also provides teachers with new perspectives when it comes to teaching children”. The ‘Just Play’ program will be launched in mid-June 2010. Following the official launching, FFS will start the process of training teachers from selected government and private schools. These teachers will then be able to implement the program at their respective schools.